Financially the PSC is in very good shape, the global reaction at the mass bombing of Gaza in July 2014, Operation Protective Edge, was such that a very high level of donations and affiliations continues, unlike the fall-off after previous IDF outrages like Operation Cast Lead in 2008/9. PSC has recruited extra staff and ended the year with a healthy surplus. was the colonial settlements, Nakba – a week for Palestine, culminating in a national event on Sunday 15 May, as in previous years, and the siege of Gaza. Then followed the elections for the Executive committee. All the existing Officer places were filled without contest. These were Hugh Lanning, Chair, Kamel Hawwash, Vice Chair, Ben Soffa, Secretary, John Ellis, Treasurer, Stephen Bell, Campaign Officer and Pia Westlin, Trade Union Liaison Officer. Eight were elected from the twelve nominations from the membership. One candidate apologised for being white but did point out that he was both gay and disabled so we should vote for him. I did not in a very politically motivated anti-sectionalist huff. And I did not vote for those who were not at the meeting or who made no political statement whatsoever apart from how experienced and good they were at their jobs. Of course one needs to know more about candidates but left with no other way of deciding and not yet being engaged in the internal politics of the PSC that was my only option. There was no obvious oppositionists like Tony Greenstein on the list. Betty Hunter and Bernard Regan were two well-known names elected amongst the eight. was after lunch which we dealt with how to strengthen our campaigning. This noted that PSC campaigning (and others too) was under serious attack through the Prevent strategy and Extremism Bill. Moves by Israel and the US – including by TTIP – to undermine BDS (this motion, No. 6, fell off the end of the agenda and was referred back) were now being actively pursued. This was the only official muted criticism of the USA in the whole AGM, of which more later. 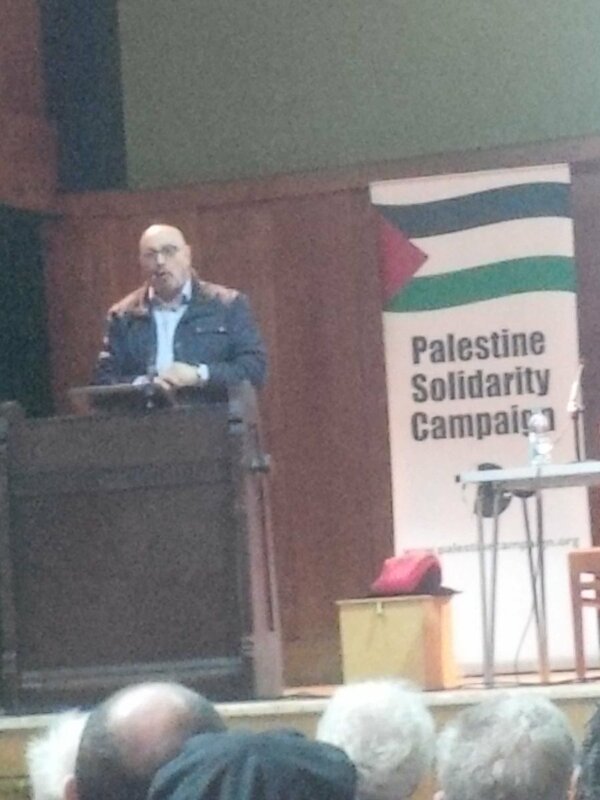 It advocated the Boycott Divestment & Sanctions (BDS), anti-racism, challenging Islamophobia and anti-Semitism. 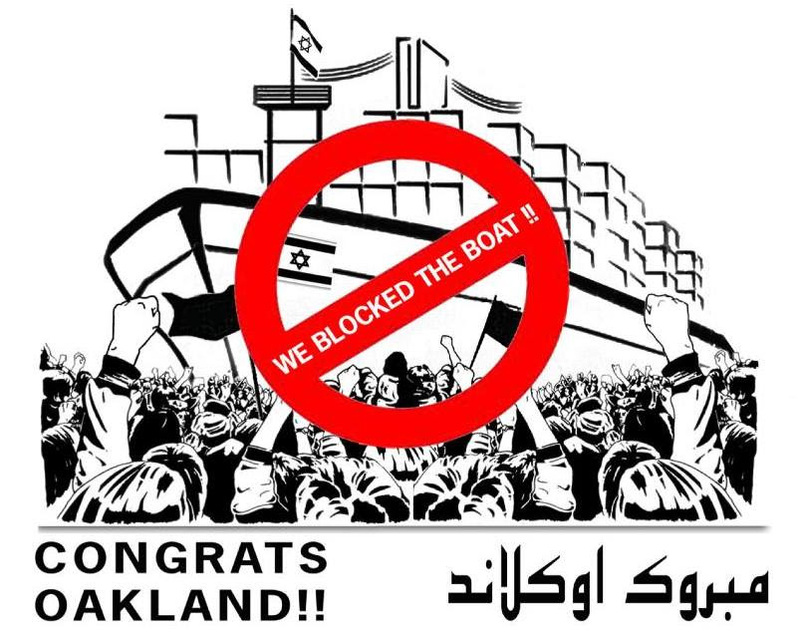 October 2014: Oakland has made history once again with another BDS victory for Palestine against the Israeli Zim shipping line. This latest round of organizing has been the most momentous and historic. Members of ILWU Local 10 informed Block the Boat organizers that the Zim Beijing which was headed to the Port of Oakland, has been re-routed to Russia to avoid disruptions at the SSA terminal. For the first time ever, an Israeli ship has been completely turned away before reaching its port of destination due to sustained overwhelming community organizing. The Executive and delegates also stressed the need to highlight both the 100 anniversary of the Balfour Declaration and the 50 anniversary of the 1967 war next year and preliminary plans were outlined for this. to build alliances for political growth, were then outlined. One delegate here raised the project of setting up a Conservative (yes, Tory) Friends of Palestine group of MPs and the Executive indicated support for this. Another delegate asked for a fortnightly newsletter to assist activists in their work and the remaining motions were taken. Motion 5, to expel Israel from the United Nations was the other controversial motion. It was moved by Blake Aklcott and seconded by Chris Burns-Cox. It had been referred back from the 2015 AGM by 134 to 74 and it was taken again here. The Executive strongly opposed with the same type of argument used against Tony Greenstein, they agreed with most of the sentiments but they had to build broad alliances and this would alienate the many of those who might support the cause. There was a lot wrong with the motion, its legalism and the illusion that the UN, which had recognised Israel and partitioned Palestine in the first place in 1948 (Joe Stalin first in with recognition there). This could not possible be the vehicle for the liberation of Palestine via a “motion to the Security council recommending that the General Assembly expel Israel in compliance with the Charter, Article 6.” But the motion did represent a progressive impulse to expel and defeat Israel and should have been supported on that basis. And wasn’t is contradictory to be for the inclusion of Palestine and the Expulsion, a PSC leader asked? Not it wasn’t replied a delegate later, both these should be taken together, this happened in 1971 when the United Nations General Assembly recognised the People’s Republic of China (PRC) and expelled Taiwan. A UK pro-Israel rally scheduled for the end of the month has been cancelled in an embarrassing blow to the British Zionist movement. The event – called “Say No to Terror: Stand With Israel” – was due to take place on January 31st in Manchester, north west England. Manchster was home to Chaim Weizmann who, almost a century ago, was instrumental in securing the Balfour Declaration which paved the way for the creation of the state of Israel, and would later became its president. Ian Donovan got to speak in support of Tony Greenstein’s amendment to Motion 1. I just missed the cut on that motion and constraints of time meant that there was only one for and one against from the floor on the motion for the expulsion of Israel from the UN. But I would like to talk about the context of all this. The amendment correctly says that the Terrorism Act 2000 would have outlawed support for the African National Congress. Yet in the days of the anti-Apartheid movement supporters of white supremacy were on the defensive. It was clear that they were supporting racism. Today it is not so clear to many. This is shown by the self-righteous tone of the political offensive being waged against Muslims and implicitly against the Palestinians. The government is claiming that ‘British values’ are universal and anti-racist, and that rejecting them is tantamount to racism and /or ‘fundamentalism’. We must not capitulate to this narrative. We must take up the idea that was once so obvious that it was even passed in the UN General Assembly in the 1970s – before it was repudiated in a great backsliding. Political Zionism is racism. Not only that, but it is the hegemonic form of racism today. Also it is the racism that does not speak its name. It has great power, not only in Israel but also in the imperialist countries generally. “Isn’t it amazing that in the whole of the conference there is no condemnation of the role of the USA in the oppression of the Palestinians. There was one mention, a demand from one delegate that we raise the arrack on the USS Liberty in 1967 that cost dozens of US lives by the Israeli Navy and carry a US flag in a demo to protest the subsequent cover-up and seek to right this injustice. Operation Protective edge is only a year and a half ago, the IDF ran out of bombs to drop of Gaza half way through and, far from stopping the mass slaughter, the US immediately re-supplied them from their ammunition dumps in Israel so the bloody business could proceed without a hitch. The US grants Israel over $3 billion annually and this amounts to a total of over $130 billion since 1949, by far the biggest recipient of US aid. Israel could not do with it does to the Palestinians without this military and economic assistance. The inability of this meeting to take ANY position on Imperialism amounts to a grovelling before the imperialist media, we must brand Hezbollah, Hamas and the PKK as ‘terrorists’ because they tell us they are and because they oppose the economic and political interests of US imperialism. There has been several references to the ‘success’ of the campaign against South African Apartheid and boycott and sanctions but I will make two points on this. Despite the welcome removal of outright racial decimation, of course a progressive thing in itself, today’s South Africa and its neighbouring Namibia are the most socially unequal societies on the planet now. The ANC and SWAPO only replaced a small section of the old ruling class with a few Black faces who became billionaires and millionaires. They retained the rest of the old regime intact, including some of the more covert features of the old apartheid. In fact they also increased the neo-liberal agenda of privatisations and facilitating transnational banks, mining companied and other corporations in exploiting Black labour. The massacre of the Marikana miners on 19 August 2014 and the crucial part played by the ANC and the former miners’ leader Cyril Ramaphosa in facilitating that massacre says it all. If all the PSC wants to do is to replace Israeli exploiters with equally vicious Palestinian exploiters, or more likely with a settlement what allows a small section of the Palestinian capitalists to buy into Israeli exploitation as ‘equal partners’, clearly Mahmoud Abbas’ aspiration, then many more Marikana-type massacres are in the offing. ASLEF General Secretary Mick Whelan made a good speech and it was a relief this year that no guest speaker to tell us of their admiration for the ‘good work’ of Mahmoud Abbas, President of the State of Palestine and Palestinian National Authority, whose term of office ended in 2009 but who unilaterally abolished elections and extended his rule indefinitely. He continues as the open stooge of Israel with no objection on his lack of democracy from any imperialist power. But when Hamas got elected by a democratic majority vote of the Palestinians in Gaza and the West Bank in 2006 these elections were refused recognition by the ‘democratic’ international community, i.e. the imperialist powers that rule the planet with compliant acquiescence of the leaders of Russia and China in any matters that does not conflict with their immediate interests. But even the miserable ‘solution’ to apartheid won in South Africa is not on offer in Israel. Only the international working class will lead the struggle for the liberation of Palestine. We saw their global potential if they are given a lead in the great response to the attack on the Mavi Marmara referred to earlier. Abbas is not Nelson Mandela, Israel proposes wholesale ethnic cleansing of Palestinians from Israel itself, from Gaza and the West Bank. And that means we must identify the USA as the main enemy of the whole of the global working class and oppressed humanity everywhere. 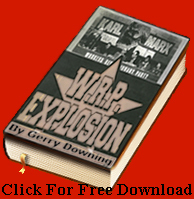 We must seek its defeat by the anti-imperialist united front and NEVER ally with it against any force fighting it. The violence of the oppressed is NOT to be equated with the violence of the oppressed, one is reactionary and the other is progressive in so far as it fight imperialism itself. 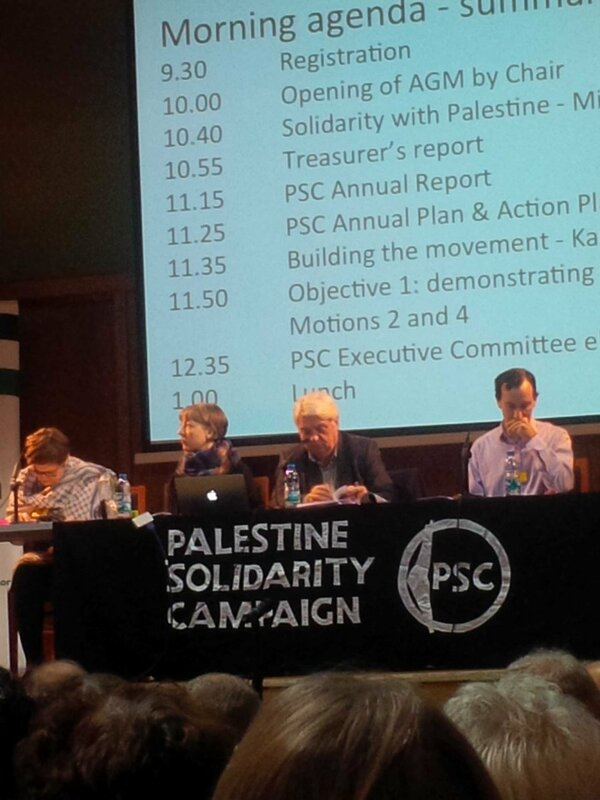 The AGM concluded with a presentation to Sarah Colborne and a speech by Palestinian Ambassador Manuel Hassassian, his 10th to a PSC AGM, outlining his vision of the way forward. « Two arrested after refusing to take down Hezbollah flag at Palestine demo. This is the link to Tony Greenstein’s report on the same meeting.